Every Peace Corps Volunteer receives a small housing and living stipend that enables them to live in a manner similar to people in their community. 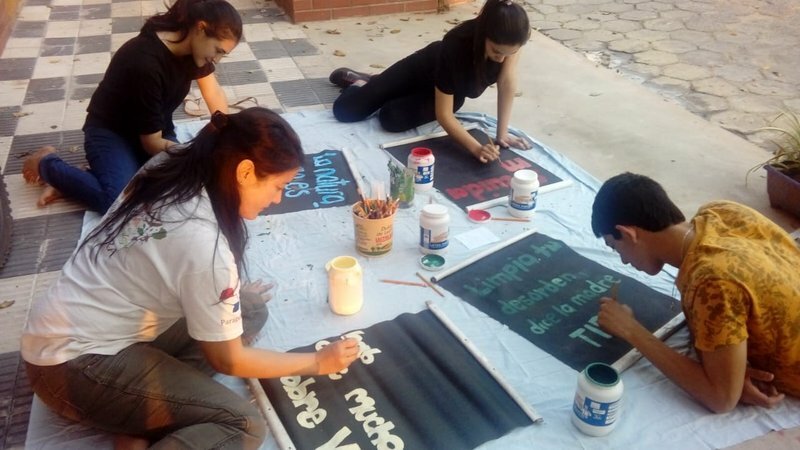 Today, environment Volunteer Bridget Tam shares how she lives on less than $7 a day in Paraguay. Projects: I am currently working on a wide variety of projects – I work with schools, a school garden, a weekly children’s eco club, a group of young adults that organize environment-themed projects like tree planting and coastal clean-ups, environmental murals, camera traps and nature photography workshops. 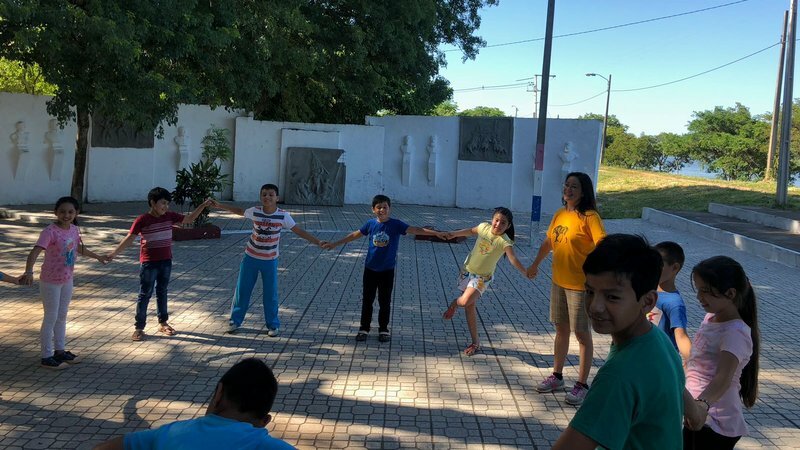 I've also partnered with a local nongovernmental organization and we've created an environmental education curriculum we're in the process of sharing with facilitators throughout Paraguay. Daily budget (if you broke down your stipend, how much would you be able to spend per day): After rent and phone, about $7 a day. Playing a game about connected ecosystems in the plaza on the Rio Paraguay. 5:30 a.m. In Jopara (a mix of Spanish and Guarani languages), this is “lunero,” said in the style of Garfield when he notes that he doesn’t like Mondays. Laundry first, washed in a large bucket. Laundry has to be done daily – I live in an urban site and I am in a tiny second-story apartment, so I only have enough patio space to hang dry four to five items. To avoid backup and get everything clean, I do laundry every day. 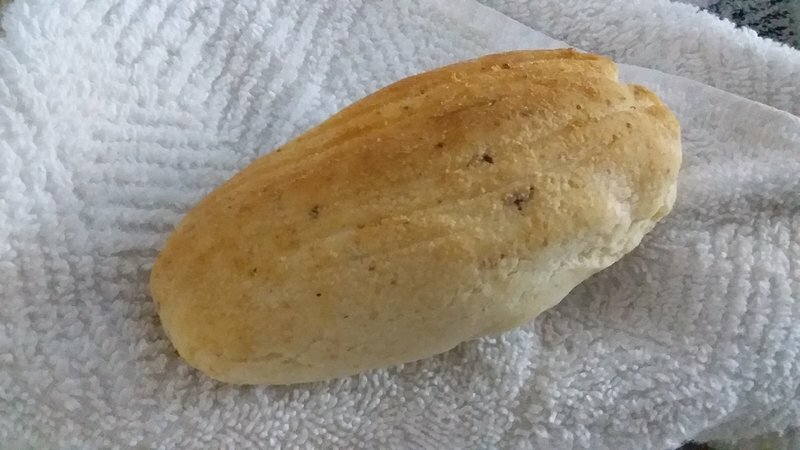 I eat a piece of pan felipe (my favorite bread here for about 500Gs or 8 cents apiece) with local honey (a large peanut butter size jar is 20,000Gs, under $4, and lasts me a couple months). I sweep, make the bed and pack my lunch – I made a pot of beans last night with New Mexico red chili (received during a recent family visit). 6:45 a.m. I take a 10-minute bike ride to the school for my Monday morning huerta escolar (school garden) class. With a class of seven to 10 fourth and fifth graders, we have built a beautiful school garden and we are almost ready to harvest. We pick up trash, start watering and as I turn the compost pile I see A., one of the fourth-grade students, has pulled out five tomato plants thinking they were weeds. This becomes a lesson on transplanting, right back in the holes from whence they came. 8:15 a.m. Tools cleaned and fence closed, I hop back on the bicycle for a 15-minute ride to the nongovernmental organization I work with as my main contact. I toss my lunch in their fridge, set up my computer, boil water for my daily mate (a hot traditional South American tea-like beverage made from the yerba mate plant, served in a cup called a guampa and sipped from a metal straw called a bombilla) and the doorbell rings. The chipa (traditional Paraguayan baked bread made with corn flour, mandioca flour, cheese, eggs and butter) lady has shown up with a big, warm basket of delicious chipa! I buy two for 2,000Gs each and my total is about 70 cents. 8:30 a.m. I catch up on emails, WhatsApp messages and message my fiancé, who is patiently waiting for me back in the U.S. (luckily this NGO has fairly-reliable Wi-Fi). 9:00 a.m. My main work contact at the NGO, J., tells me that we can use the truck to visit the ferretería (local hardware store). We have just received news from the municipality that they will buy all the supplies and paint necessary for an environmental mural project at a local school! 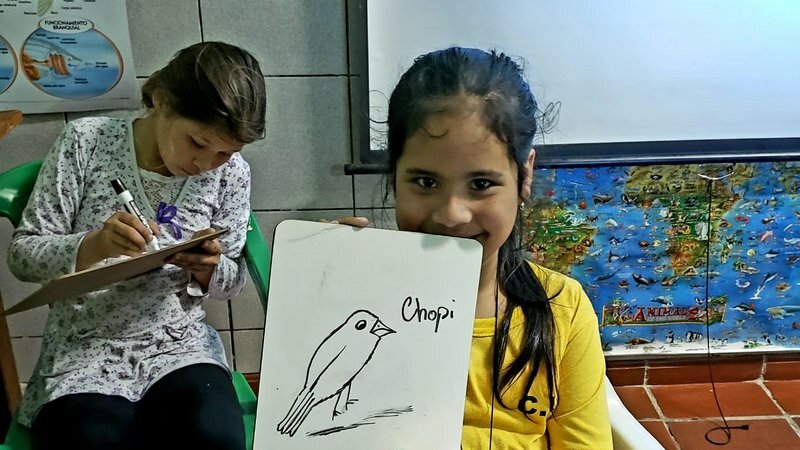 This will be a week-long project teaching about the various ecoregions of Paraguay and the flora and fauna that can be found in each, and will culminate with a wall mural, similar to the popular Peace Corps world map projects. 10:00 a.m. All done with the ferretería and loaded up with over $100 worth of paint and supplies paid for by the Municipalidad! 10:15 a.m. With supplies and dates approved by the school director, it is now time to work on a cronograma (projected schedule) of the mural project. Looks like we will do one full week of charlas (talks), games and activities, each day including a task for the wall: sanding and caulking, primer, painting the background, a day to dry, then trace the borders and a full morning of painting in the regions and designs. 1:00 p.m. Lunch time! I warm up my beans and sprinkle some leftover tortilla chip crumbs on top. In addition to fairly-reliable Wi-Fi, my NGO also has a microwave. I am very lucky. 1:20 p.m. After sending a rough draft of my projected mural schedule to the director, I touch base with the teacher with whom I work to facilitate a garden class on Wednesday. I've talked to several Volunteers about how they use their eco club starter kits – the NGO I work with was awarded a grant that allowed us to provide facilitators of eco clubs around Paraguay with a kit that includes school supplies; these were distributed early in the year and now I am preparing a report for the grant providers on how many children their kits have reached in Paraguay. The number right now is just under 700. 3:00 p.m. Visit a local professional photographer to ask if they are interested in hosting a workshop. Some Volunteers work with a photography program called Ahecha (“I see” in Guarani) and my site has two different eco-clubs and a group of about 30 jovenes (young adults 15-25) working with the program. The owner is not there but I leave my information. 4:00 p.m. I start working on a project plan to create a nature trail on a local military base. They've already allowed my eco club to place camera traps to collect data and photos of the local wildlife, J., the deputy director of the NGO, and I also mentioned the idea of a nature trail and they seemed receptive to it. Now I just need to make it formal. 9:00 p.m. I am home, showered and in bed reading before 10:00 p.m.
Students pictured in the school garden. 6:30 a.m. No garden class this morning, so I sleep a bit later. Laundry, sweep and pan felipe. 7:30 a.m. 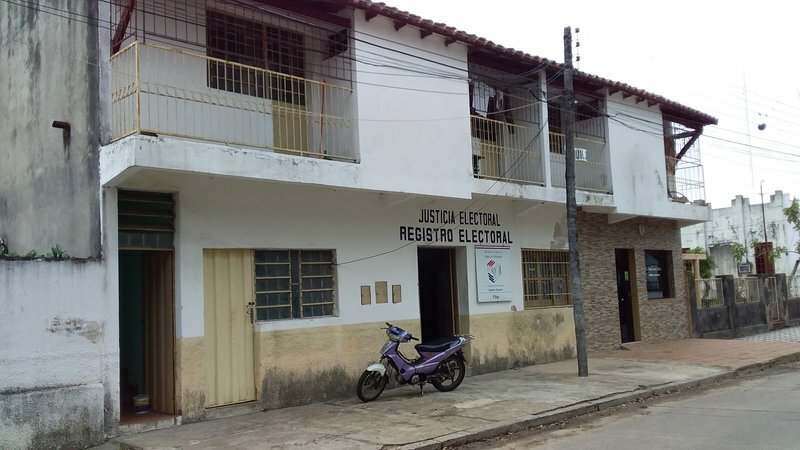 I bike to the NGO, prepare my mate, and set up my computer and wait for the chipa lady. I catch up on messages and emails and it turns out my host brother is in town. He has been working in the Chaco, an arid region in the northwest of Paraguay. He does incredible work with indigenous populations to reduce poverty, helping organize local artisans so they can sell their products. I plan to have lunch with him and the rest of my host family. I usually visit them about once a week, either for Sunday morning mass or a long lunch, but I am extra excited to hear about my brother’s most recent work. 8:30 a.m. Chipa lady is here! I know I have a big lunch ahead, so I only buy one chipa today. 2,000Gs or about 35 cents. 11:30 a.m. I bike about 15 minutes to my host family’s home and arrive just in time for terere! Terere is a traditional Paraguayan beverage that uses the same yerba mate from mate, but it is served cold and always shared. Seven of us sit in a circle outside and share the terere, catching up on the week, my brother's work, all the non-present family members and any new Guarani words I have learned. 12:30 p.m. Lunch is one of my favorites, bori bori with chicken. It is a soup with vegetables and little balls of corn flour, like corn dumplings. After a long lunch and helping with dishes, half of the family starts disappearing for their afternoon siestas. I head back to the NGO to finish up my proposal for the nature trail project. 7:30 p.m. Every Tuesday night, the staff, volunteers and interns at the NGO go to a local pizza place for 20,000G all-you-can-eat pizza night. It's not the best pizza I've ever had but for less than $4 all-you-can-eat, I hardly ever say no. Occasionally we share a few drinks and because it is our ornithology intern’s last week in Paraguay, tonight is one of those nights. The final tab for each of us is 26,000Gs. Chipa is a traditional Paraguayan baked bread made with corn flour, mandioca flour, cheese, eggs and butter. 6:30 a.m. I'm all out of pan felipe and craving mbeju (a Paraguayan pancake-type snack made with mandioca or corn flour, butter and cheese). There is a small restaurant in my site where I can get a mbeju and a cocido (another hot beverage made from yerba mate and sugar) for 6,000Gs, or just over $1, and this is where I go eat. 7:15 a.m. I bike to the NGO. 8:30 a.m. My site mate L., a community development Volunteer, stops by. I had previously offered to show him where the post office is. One of the great things about being placed in an urban site is that all the nearby Volunteers visit regularly to get mail, groceries, internet and visit the bank. 9:00 a.m. I missed the chipa lady. 10:00 a.m. L. and I walk to the printing and copy shop so I can print out my sendero (nature trail) project plan and letter, and some BioBlitz checklists for the eco club on Saturday. As of now, Saturday’s eco club plan will be a walk along the river with bird and insect guides, binoculars and magnifying glasses for a BioBlitz – as a group, we will try to count as many different species of plants, birds, mammals, insects, reptiles and amphibians as possible. 3,000Gs to print everything including one color print of the BioBlitz list, which, if approved by the other facilitators, I will then make copies of. 52 cents. 11:15 a.m. L. leaves to run other errands and I warm up more beans. 12:45 p.m. I head to my huerta class armed with garlic (1,500.00Gs or 26 cents) and ash to make vanenos caseros (organic homemade pesticides). Four students show up and I divvy out the materials and teach as we prepare the concoctions to battle the vichos (non-beneficial insects). 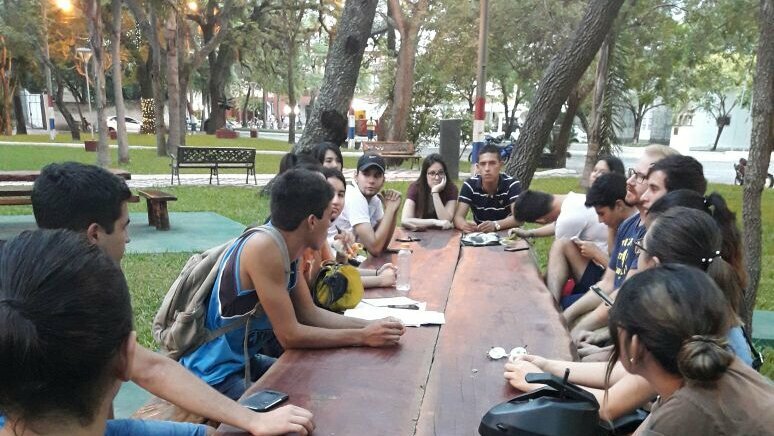 4:00 p.m. Meeting of our local youth group, a group of young adults who came together via a WhatsApp group that wanted to focus on urban arborization. They organize community clean-ups, tree plantings, charlas and events focused on the three R’s (reduce, reuse, recycle). Today’s meeting is focused on a bicicleteada, a bicycle event this Sunday. The event is aimed at promoting a cleaner, more sustainable method of transportation. We decide on a path, distance and plan how to rent our bicycles and helmets to those who don’t have their own. 6:00 p.m. An early and relaxing evening. I shower and settle in with popcorn and a book. One of the first meetings of a group of young adults that will focus on environmental conservation and community action. 6:30 a.m. It rained a little bit yesterday and none of my laundry dried, so I leave everything out on the line for another day and let yesterday’s laundry wait for tomorrow. I am running at a more relaxed pace this morning – clean a bit, drink my mate in my apartment and use some of the leftover hot water for oatmeal with honey. 8:00 a.m. I will eat my last bowl of beans for lunch today, so I head to the grocery store. I am lucky to have a nice size grocery store in my site. I decide to make curry with some spices my family brought and buy two carrots, a large onion, a green pepper, a potato, a small bag of rice and a four-pack of toilet paper for 16,370Gs or $2.84. 10:00 a.m. After dropping off my groceries at my apartment I head over to the NGO to talk about Saturday’s eco club plans with the other facilitators and check emails and messages. 12:00 p.m. I warm up my last bowl of beans and New Mexican red chili – I will miss this flavor. 6:00 p.m. All done painting and I head home to make my curry, feed the ends of the carrots, outside of the onion, bell pepper stem and potato peels to my worms (my small patio has room for two worm compost bins), and read. Painting environmental slogans with youth group members. 7:00 a.m. My laundry is finally dry, so I can resume my routine. 8:00 a.m. I stop by the almacen (small corner store) because I am out of yerba, I opt for the lemon flavor. 5,200Gs or 90 cents (this box will last me for a couple weeks). 9:00 a.m. Chipa in hand and mate prepared, it's time to organize and finalize all plans for Saturday and Sunday – field guides, binoculars, checklists, clipboards, pencils and magnifying glasses are ready to go. Cookies, juice and water – check. The NGO is providing a ladder for the bicycle event; I confirm the truck will be available and that we have a photographer. 2,000Gs or 35 cents. 11:30 a.m. I warm up curry for lunch and feel ready for the weekend. 1:00 p.m. My dear Paraguayan friend B. comes by to proofread and correct my nature trail project and letter. I don’t know what I would do without her. 5:00 p.m. A Volunteer in a site about 40 kilometers away is in town to visit the bank and catch a bus to the capital. Her bus doesn't leave until later, so we plan to grab dinner. There are no restaurants in her site, so she is always excited to eat out here. 8:00 p.m. We decide on a place fashioned like a food truck park. The owner has taken painted old shipping crates bright colors; each has its own specialty: asaditos (kind of like a kabob) lomitos, hamburgers, juices, ice cream and pizza. I go for two asaditos with a side of mandioca (a starchy root vegetable) for 10,000Gs or $1.74. A street scene of Bridget's community in Paraguay. 7:00 a.m. I’m awake! Saturdays are hands down my favorite day of the week. I get to play with kids and teach/learn about nature all day long. I am always exhausted at the end of the day, but it is always vale la pena (worth it). 8:15 a.m. I head to the NGO for last-minute preparations. 9:00 a.m. Students start trickling in – 12 show up today. We show the nature photos that one student took during the week. We explain what a BioBlitz is, hand out materials, remind the kids of the rules and head out to count species. 12:30 p.m. The last students trickle out and I wash juice cups, sweep up cookie crumbs, put binoculars in the correct cases, count magnifying glasses, and put away pencils and data sheets. 1:00 p.m. I microwave curry for lunch and catch up on WhatsApp messages. C., a friend and member of the youth group, recently started a branch of the eco club at his school on Saturday afternoons. He has such great energy and is wonderful with children. I ask what materials he needs for today’s class and pack them up. 1:30 p.m. I jump on the bicycle and head into town. Today will be the eighth eco club meeting and we will learn about ecosystems and habitats. C. has prepared games, a PowerPoint presentation, and an arts and crafts project. 4:30 p.m. We had 11 children come and all of C.’s activities went well. We clean up and say goodbye. I'm going to try to sneak in a nap before dinner. I love that post-lunch naps are considered essential in Paraguay. 7:30 p.m. I wake up refreshed and check my WhatsApp to find a group of friends is meeting at a local restaurant in an hour. 8:30 p.m. My site has a little pizza place owned by an Italian who fell in love with a Paraguayan woman, moved here and opened a restaurant. I am so happy that this is where my friends have decided to eat. I share a pizza and fries with a friend; my final bill is 25,000Gs or $4.34. Students draw their favorite species. 5:30 a.m. I awake to a big rainstorm and my fan and refrigerator have shut off, so the electricity must not be working. This does not bode well for the bicicleteada. In Paraguay, almost everything is cancelled when it rains, usually because of infrastructure and muddy roads, but even in urban areas, rain is a sign to stay in bed. So, I do. 8:00 a.m. I wake up and it seems the rain has stopped, but the electricity is still not on. I message the members of the youth group who helped plan the bicicleteada and we decide to wait a little longer to decide whether to cancel. 10:00 a.m. It is raining even harder now. Even if the rain stopped completely, there are parts of the trail that will be completely muddy now. We decide to postpone the event until next Sunday. We make a flier to share with everyone. 11:45 a.m. I have been loving my lazy day of cleaning and reading. Electricity comes back and I decide to venture out and see if any restaurants are ope. I get lucky and find one serving tallarín (a thick linguine-type pasta), sopa Paraguay and mandioca. 15,000Gs or about $2.60. 12:30 p.m. I get home and read more, then take part in one of my favorite customs: the afternoon siesta, or nap. 3:20 p.m. Have I already mentioned how much I love naps? I make tea, clean up a bit, plan for work on Monday and, eventually, fall back into my book. 8:00 p.m. These very lazy days don’t happen very often but I feel I have completely taken advantage of it – my tiny apartment feels clean and organized, I am loving the book I am reading, I am prepared for tomorrow and I had an amazing nap. I've been snacking on things I have in the apartment, mostly nuts and dried fruit, but I am completely satisfied after my gigantic lunch. 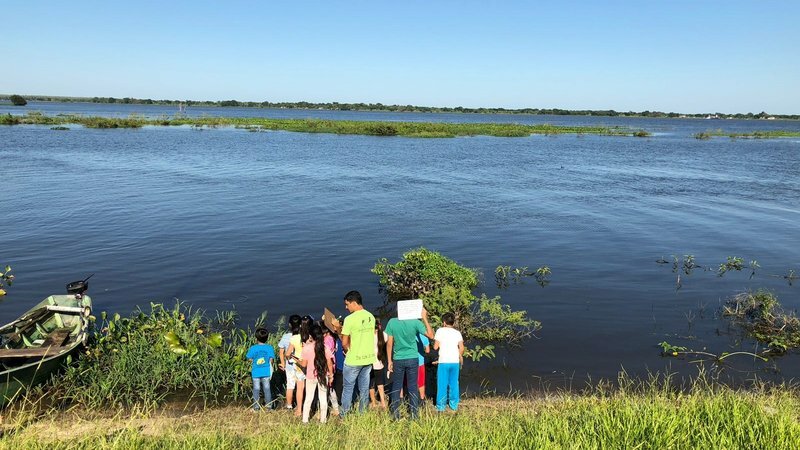 Members of Bridget's Eco club, Voces de la Naturaleza on the Rio Paraguay, studying ecosystems in better weather. I feel that I ate out for dinner much more often this week than normal, but sometimes there are just weeks with more events and visitors than usual. One of the things I love about Peace Corps service is that week to week, day to day, my schedule is rarely ever the same. 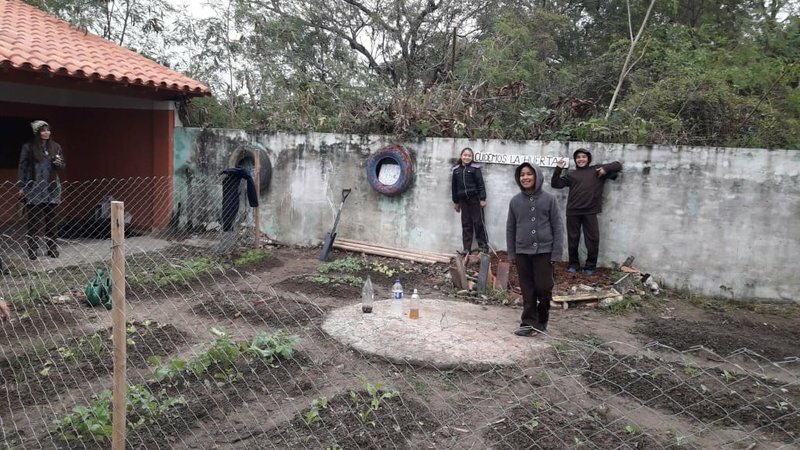 Bridget Tam is an environment Volunteer in an urban site in the wetlands of southwest of Paraguay. She is from New Mexico.